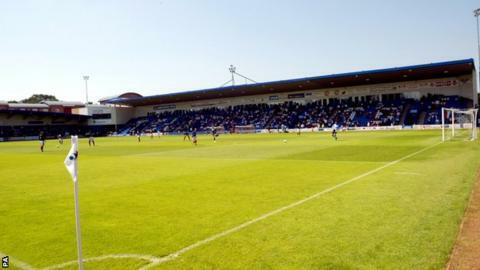 AFC Telford United returned to the top of the Conference North table with a convincing home win over Altrincham. Despite a 6-1 midweek loss at Guiseley, the Bucks started confidently, Mike Grogan heading them into an early lead. Matty McGinn's set-piece five minutes into the second half then allowed Neil Byrne to head home the second. Adam Farrell scored the third with 20 minutes to go to seal victory, before a late consolation goal from Altrincham's James Walshaw. With morning leaders North Ferriby United dropping points in a 0-0 draw at home to Stockport, Telford are now a point clear at the top with five games left, going into Tuesday night's trip to Oxford City. North Ferriby, the Bucks' only serious title rivals, are also in action on Tuesday evening, at struggling Stalybridge, after which their final four fixtures are all against sides currently in the top eight.